Candidates line up Tuesday afternoon shortly before the deadline to file for the School Board election. It’s been a long time since an election for the Hamtramck School Board attracted many candidates. This year is either an exception of a sign of things to come. As of Thursday, the day The Review went to press, 16 candidates are lined up to square off in the November Election. Candidates had until Friday (July 25) to drop out of the election. One factor adding to the uptick in candidates is that there are five seats under consideration. Because of past resignations from school boardmembers, there are three seats open for a full six-year term, one seat with four years left in its term and another seat with just two years left in its term. The biggest surprise in the election is that School Board President Titus Walters is not seeking re-election. Walters told The Review that he would rather concentrate on his job as city councilmember. Also not seeking re-election is Boardmember Yvonne Myrick. The only incumbents running are Alan Shulgon, who is going for a six-year term, Evan Major, who is also seeking a six-year term and Eric Burkman, whole filed for the four-year seat. Other familiar names include City Councilmember Anam Miah, who is seeking a six-year term, and former Councilmember Cathie Gordon, who is going after the four-year term. For the six-year term (beside Shulgon, Major and Miah): Tufail Numan, Mohammad Huda, Nasir Sabuj, Saad Almasmari, M. Always and Dennis Lukas. In the four-year seat (beside Burkman and Gordon): Ataur Khan and Anwar Almasmari. The two-year race features: Ripon Lasker, Omar Almasmari and Jackie Starr. The election, at least so far, is a first in Hamtramck school elections. Many of the candidates are Bangladeshi- or Yemeni-Americans. Both communities have become more politically active in recent years. Until now, candidates from those communities have set their sights on the city council or a seat in the state House of Representatives. In past school board elections, incumbents usually met little to no challenge in being re-elected. With Walters and Myrick not running, there will no longer be any African-Americans serving on the School Board. 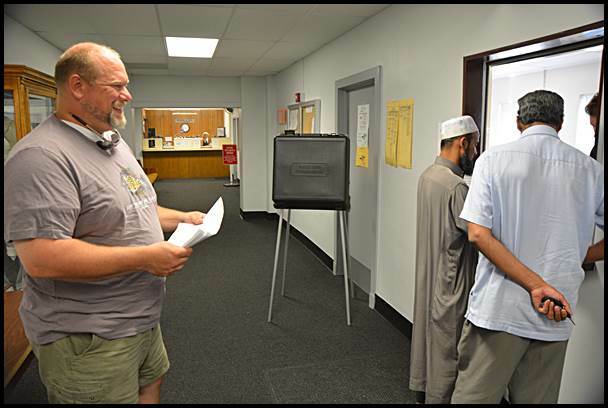 According to City Clerk August Gitschlag, the candidate insisted his name appear on the ballot that way. But according to his voter registration, his full name is Malek Mohamed-Alwey Hussein. In his affidavit filing for candidacy he said his name is Malek Alway Hussein Hussein. Gitschlag said Hussein told him that he is known in the community as M. Alway.